The Board met on Saturday February 23rd, 2019 – the first meeting for the year. A special time to pray for the College and to discuss and discern future directions. The Board endorsed the Global Horizons program as a way to help students and staff understand the connections between all the activities they do, to nurture our students as future leaders and to become people who will know, love and serve God in a global context. 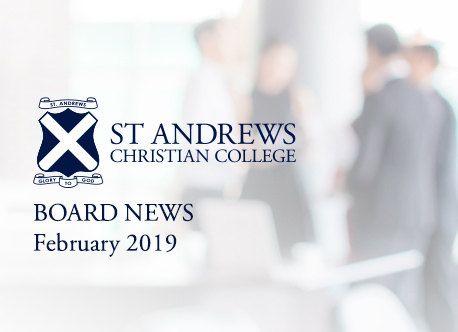 Strategic Directions 2019 -2021 which builds upon where we have come from, includes planning for beyond our current site, and seeks to ensure we remain Christ-centred with students achieving outstanding outcomes, were also endorsed by the Board. The Board continues to acknowledge the outstanding leadership shown by Mrs Catriona Wansbrough and her ELT as the College faces difficult and uncertain times in our fight to retain religious freedom. We encourage the school community to pray for and to petition our leaders and our political parties to make good and wise decisions.